Check for your nearest distributor to avoid shipping fees. Orders are processed and shipped within 5 to 7 days of receipt. SEA-90 fertilizer is natural mineral crystals produced by solar dehydration of sea water trapped in retention ponds in a very arid and pristine coastal region devoid of industry or agriculture. The particular sea utilized by SeaAgri is considered as one of the most diverse in marine life and minerals on earth. 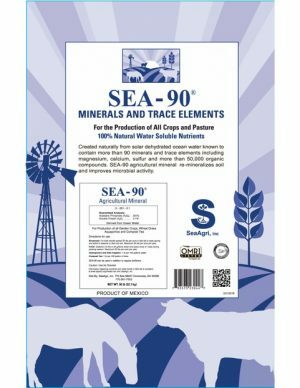 The full spectrum minerals and trace elements contained in SEA-90 are exactly proportioned and balanced as in sea water to sustain optimum biological life. 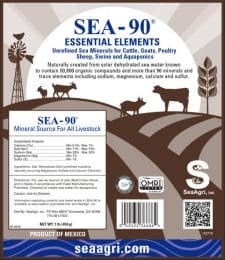 Consider that the elements in sea water are at essentially the same ratios as human blood, and that sea life living in pure and balanced ocean water seems immune to most cancer and other degenerative diseases. SEA-90 fertilizer, a trace mineral salt, is the product of 40 years of extensive research by Dr. Maynard Murray and SeaAgri proving that soils and crops enhanced or remineralized with full spectrum sea minerals and trace elements grow crops superior to those grown solely with conventional fertilizers. SEA-90 can be broadcast directly on the soil surface and allowed to absorb into the soil or dissolved and sprayed directly onto growing crops and plants. 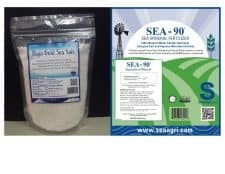 SEA-90 is a great stand alone fertilizer or mix it with any other product. Check our application pages or call Robert Cain at 770-361-7003 for more information.